Love and compassion are definitely the essences of human life. We cannot imagine humanity without them. Even animals, who have less thinking capability than us, exhibit their nature that has love and care for their race. The way a mother monkey carries her dead infant even after its death is nothing but a sign of love and attachment. Quite same is with humans. Even before beginning our human life, love, and compassion came in. When a baby is in the womb of mother, he is completely at her love and care. From the air that he breathes to the nutrition that he receives is received from the mother. Then after he is born, a baby is completely dependent on his mother. An infant is not capable of doing anything on its own. Hence it is the love and care of his mother that makes him live. So being a mother itself is the greatest example of love and compassion. The amount of sacrifice a mother has to do to raise a child is enormous and cannot be compared to anything in the world. Some people would disagree saying it’s the duty of a parent to do so and hence there is nothing extraordinary about what parents do for a child. But then they should not forget about the cases we hear when infants are found lying in the dustbins and to the mercy of the Lord. Why are Love and Compassion so Important? The world, if we look from a human life perspective, is full of tragedies, problems, pains and sufferings. Most of the people are surrounded by problems that ail their happiness. So somewhere we all suffer. The reason and magnitude can differ. But if we only care about our problems and sufferings then humanity itself will be questioned. Here comes the need for compassion. When we try to understand the pain of others and how they are feeling in the painful situation, then we try to help them. If not more, we at least don’t try to increase their problems. Empathy and compassion is the need of the hour. People confuse these states of mind with sympathy. People in pain do not need sympathy but they want to be empathized with. Trying to feel what others are going through and then helping them in any manner possible is what is required. 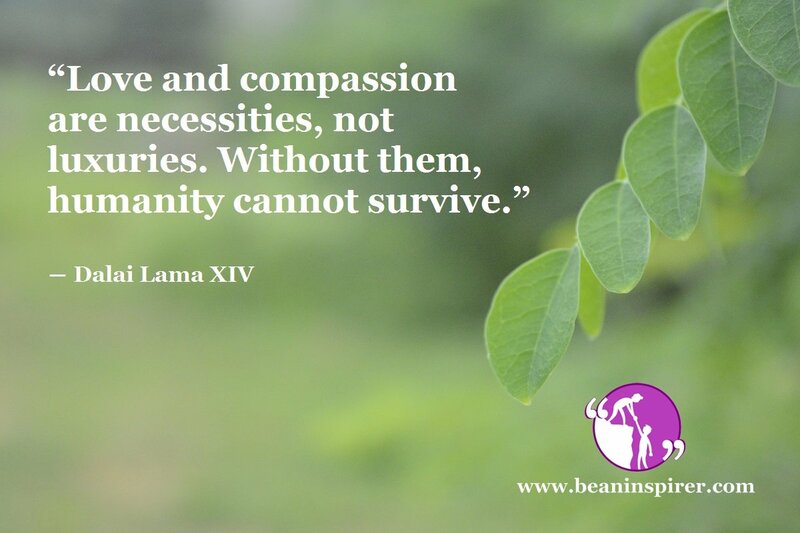 It is for this reason that love and compassion are not a luxury but a necessity. When are Love and Compassion Needed? There is no particular moment in time when we need love and compassion. Rather they are a part of our basic nature. The basic essence of being a human being is to be empathetic, loving and compassionate. When we see a person who in pain or some trouble, we should try to put ourselves in his shoes and then try to feel what he or she must be going through. This process makes us aware of what our ideal behavior should be like. For example, if we see a physically disabled person then we should try to be compassionate towards them. Here we are not telling you to show them sympathy. This is the least that is needed. Rather we should understand the sufferings they are going through and try to lessen their pain by being genuinely empathetic and treating them normally and not doing things that would discourage them. Further, if we see a pregnant lady on a bus or train, we should offer her a seat. It is not just a part of chivalry for men but is also applicable to women. If a woman will not be compassionate for other women, how can we expect men to be empathetic for women since they are physically different and therefore understanding the pain and hardships of a pregnancy is more difficult? We should, at all times, try to feel what another person is going through. This will help us understand their condition and will enable us to be thoughtful. There are instances when people mock someone’s ailments. This is nothing but the lack of compassion in them. Doing this increases the hardships of the person already in pain. Love and compassion are a state of mind that should be with us all the time. We don’t need to be a saint to practice this in life. There are endless moments when we can shower love and care on others. The feelings of compassion and love are not restricted to other humans but also apply for animals and other living beings. Since we are the most developed of all the creatures on the planet, it is an extra responsibility for us to be considerate to animals and other lower species. It is only these feelings that make us different and above any other living organism on the planet.